"These can be tricky to get the right consistency. After years of experimenting with the basic recipe, I found these to come out soft but not falling apart. If you like firm/hard-middle matzah balls, either reduce the seltzer or add 1/4 cup matzah meal." Whisk eggs and olive oil in a bowl until combined; stir both amounts of club soda and salt into egg mixture. Mix matzo meal into wet ingredients to form a workable dough; if mixture is too wet, stir in 1/4 cup more matzo meal. Cover and refrigerate for 30 minutes. Bring water to a boil in a large pot. Wet your hands and form matzo ball dough into walnut-size balls. Gently place matzo balls into boiling water. Reduce heat to low, cover, and simmer matzo balls until tender, 25 to 30 minutes. Do not store matzah balls in your chicken soup; they will absorb the liquid and become mushy. Store separately and heat with your soup. I have tried probably ten recipes for matzoh balls. This one is the BEST!! 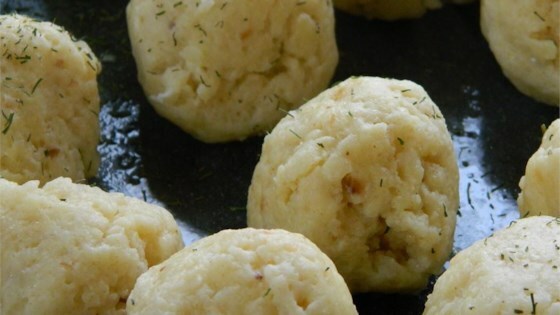 Delicious tender matzo balls. I made them exactly as ''tis recipe states. My family loves them! This is my favorite matzah ball receipe. Easy and fast to make, stayed together beautifully. Tasted great.